Playing nothing but arpeggios can sound unnatural. There’s lack of fluidity and a surplus of predictability if you play nothing but chord-tones. Let’s mix it up with non chord-tones. Non chord-tones are simply the notes in the scale that aren’t in the chord. To keep it clear, I’ll just use a C major chord. That’s a bit more fluid. I’ve inserted the non chord-tone F between C and E, and between E and G. Then between G and C, I’ve inserted to non chord-tones in a row – A and D.
Notice that there’s a leap of a 4th (C to F) right at the beginning. There’s another one at the end – A to D. From a compositional standpoint, that’s a nice balancing technique. What’s interesting is that the leap from A to D sounds more dramatic, making those 4ths both the same and different. There are a couple of reasons that the A to D sounds more dramatic. The leap from C to F isn’t preceded by any closely spaced intervals like everything before the leap from A to D. So no contrast. The leap from C to F is in a lower register than the leap from A to D. The higher register on an instrument has a more in-your-face quality. Add rhythm, and it gets better. 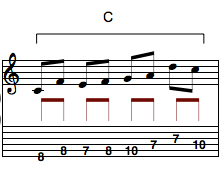 Of course, non chord-tones aren’t just the other notes in the scale. They’re also the other notes outside the scale: C#, D#, F#, and G#. Try playing and resolving those to chord tones. 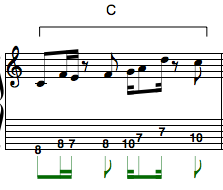 Here’s the C chromatic scale with the chord tones (CT) marked. Everything else is for creating tension. And tension is always resolved by moving to a chord-tone.